I was in attendance for the annual Inter-High DCIAA Turkey Bowl Championship game on Thanksgiving day at Eastern HS. The participating teams via for the championship were Ballou and Woodson on a beautiful bright sun shiny day. I don’t remember the last time I attended a HS Championship game, but this was a special day. 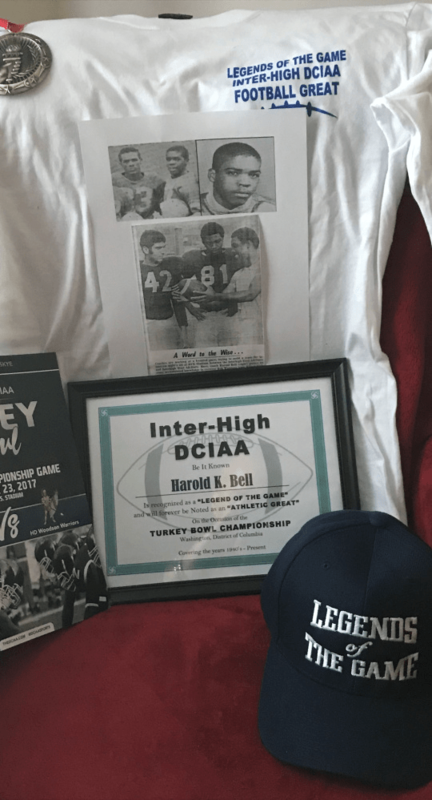 They were honoring inter-high DCIAA FOOTBALL LEGENDS. I was one of the so-called football legends being honored and this is where it got kind of confusing. One of my favorite sayings “Some of us are legends in our own time and others are legends in their own minds” and on this day the saying was in full evidence. There were about 50+ athletes under the VIP tent disguised as “Football Greats.” There were only a handfull of legends in attendance led by Phelps HS great and all-around athlete Rock Greene. The others in attendance were “The Usual Suspects” of wanna-bees, but a shoutout still goes out to Ms. Lucille Hester for the thought. My contributions as a student/athlete (1958 First Team All-High), coach, community advocate, innovator and pioneer in the DC public school system made me worthy of an invitation. In 1967 as a Roving Leader I help prevent further tragedy after a Spingarn student was shot outside the school immediately after a basketball game between Spingarn and McKinley Tech. There was talk of revenge when I arrived on the scene. My next move was to travel to Baltimore where the NBA All-Star Game was being played. I went there to ask NBA rookie and Spingarn alumnus Dave Bing to join me at the school to calm things down. Monday morning Bing walked into a full student-body assembly to a standing ovation. His words of wisdom brought peace back to the school community. On April 4,1968 I was standing on a street corner at 9th & U NW with my co-worker and NFL Hall of Fame player Willie Wood (DC Public School legend) when all hell broke loose with the assassination of Dr. Martin Luther King, Jr. When the smoke and tear gas had cleared after the riot my wife Hattie and I founded our non-profit organization Kids In Trouble. We established the longest on-going community Christmas toy party for DC elementary school children in DC. December 2017 will mark the 49th anniversary of the toy party. In 1968, I was the Wide Receiver coach for Cardozo HS football champions and the WR coach for East/West HS All-Star game. In 1969, I established the first ever city-wide elementary school tag football league. Harrison Elementary School located at 13th V Street, NW were the first city champions (Harrison Hustlers) coached by yours truly. In 1970 I became the first Black/Afro-American to host and produce his own radio sports talk show “Inside Sports” in DC @ W-O-O-K Radio. In 1971 I encouraged Washington Redskins players WR Roy Jefferson, RB Larry Brown, LB Harold McLinton and DB Ted Vactor to join the KIT team to help enhance the growth of inner-city children. Kids In Trouble was the host of a celebrity tribute to former DC Public High School players, QB Cornelius Green, RB Woodrow Roach and RB Lenny Willis of Ohio State in 1973. Legendary Coach Woody Hayes and two-time Heisman Trophy winner Archie Griffin were in attendance. In 1975 I was the Black/Afro-American to host and produce his own television sports special in prime time on NBC affiliate WRC-TV 4. My special guest was Muhammad Ali. Mayor Marion Barry established a city-wide community softball league with cops and gang members playing side by side hoping to bring peace between the two in 1978. My cop/gang team from Harrison playground were crowned the champions. In 1980, I was named Washingtonian of the Year by Washingtonian Magazine making me the first sportscaster ever honored. When all is said and done all the glory goes to God—Merry Christmas! Hey Buddy!, I found this information for you: "Making A Difference 365 Days A Year by Harold Bell". Here is the website link: https://blackmeninamerica.com/making-a-difference-365-days-a-year-by-harold-bell/. Thank you.